For me, a meal isn’t complete without a big heaping pile of vegetables. However, I’m married to a man who thinks potatoes are the only vegetable he will ever need. Don’t get me wrong, potatoes are a great vegetable but I like a little color and variety on my plate. Recently, I’ve been experimenting with various ways of getting more vegetables on not only my plate but my husband’s as well. Luckily for me, I discovered that flavoring any vegetable with Indian spices like cumin, coriander, red chile powder and turmeric is the way to go when it comes to sneaking in something healthy for my spouse. When in doubt, spice it up! Since then, these have been a big hit in my household. Sweet, salty, spicy-I can’t get enough of these delicious morsels. 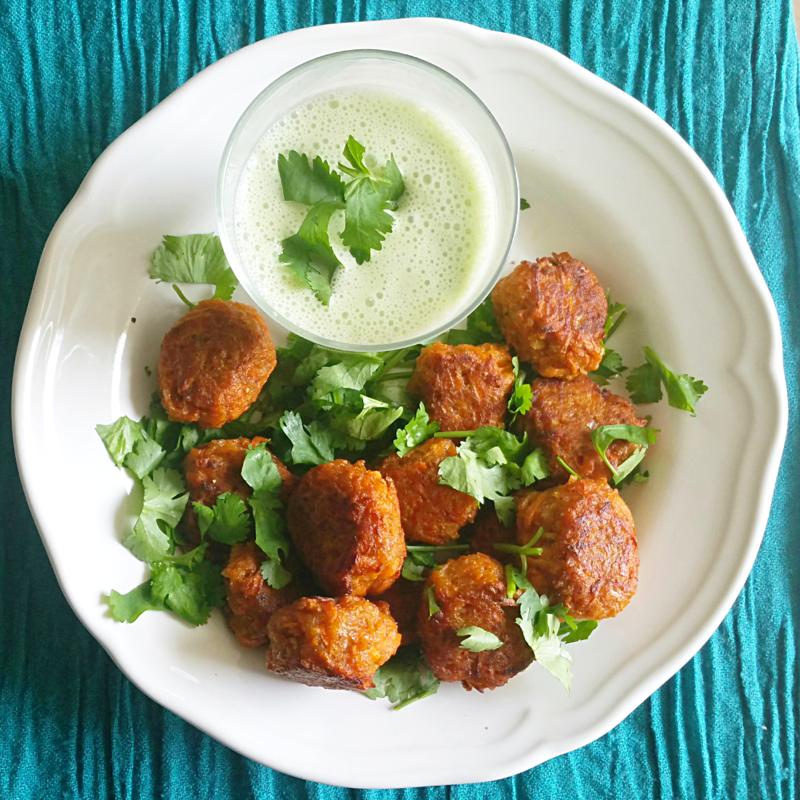 These Indian spiced carrot balls are great as a starter, cocktail party hors d’oeuvres or accompaniment to a spicy curry. Pair it with a garlic and lemon yogurt sauce as a great way to cool the spice if you are not used to the heat and add some tartness. Combine grated carrots and onion in a mixing bowl and combine. Sprinkle with spices and sea salt and toss together. Add cornstarch and flour and combine to make a dough. Using your hands or a tablespoon, form dough into balls around 1in/2cm in diameter. Add oil to a medium non-stick frying pan and heat over medium high heat. When oil is hot, add carrot bhaji balls and fry until crispy on both sides. Take out and drain excess oil on paper towels and sprinkle with freshly cracked black pepper. Serve with a yogurt dipping sauce. Combine grated carrots and onion in a mixing bowl and combine. Sprinkle with spices and sea salt and toss together. Add cornstarch and flour and combine to make a dough. Using your hands or a tablespoon, form dough into balls around 1in/2cm in diameter. Add oil to a medium non-stick frying pan and heat over medium high heat. When oil is hot, add carrot bhaji balls and fry until crispy on both sides. Take out and drain excess oil on paper towels and sprinkle with freshly cracked black pepper. Serve with a yogurt dipping sauce. Combine yogurt, garlic, lemon juice, salt, scallions and black pepper together and blend in a food processor or blender until smooth. Combine yogurt, garlic, lemon juice, salt, scallions and black pepper together and blend in a food processor or blender until smooth. Let sit for 5-10 minutes before serving.